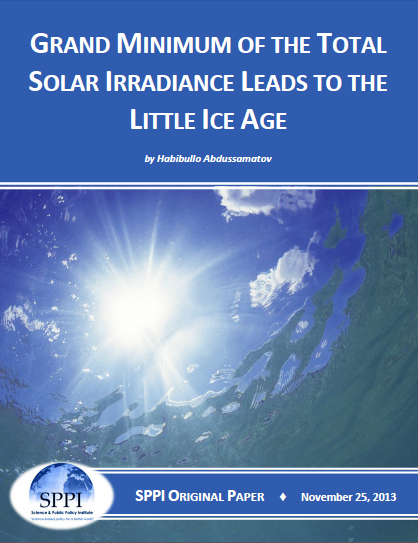 A new paper by solar physicist by Habibullo Abdussamatov predicts the current lull in solar activity will continue and lead to a new Little Ice Age within the next 30 years. 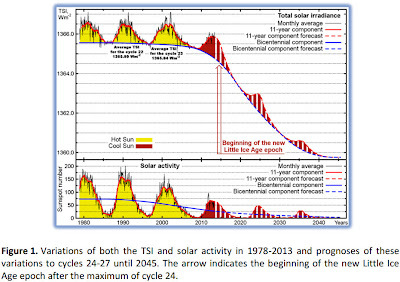 The start of Grand Maunder-type Minimum of the TSI of the quasibicentennial cycle is anticipated in solar cycle 27±1 about the year 2043±11 and the beginning of the phase of deep cooling of the 19th Little Ice Age in the past 7,500 years in the year 2060±11 Figure 1, 2). Now we witness the transitional period from warming to deep cooling characterized by unstable climate changes when the global temperature will oscillate (approximately until 2014) around the maximum achieved in 1998-005. these prognoses are confirmed by the Sun itself and the course of global temperature changes and the level of the World ocean for the past 16 years. In general, by analogy with the seasons on Earth there is also a similar alternation of climatic conditions in the Solar System, dictated by the quasi-bicentennial cycle variation of the TSI. From this point of view, ow the whole of our Solar System after season of the “solar summer” is moving to the season of the “solar autumn” and then will move to the season of the “solar winter” of the quasibicentennial solar cycle. There is simultaneous warming of the Earth, Mars and the whole Solar System which has a natural solar origin and confirms the action of “solar summer” throughout the Solar system and alternation of climate conditions in it. The content of greenhouse gases in the atmosphere largely depends on the World Ocean, and the content of dust depends on volcanic activity and on the rise of aerosols rom and. The amounts of natural flows (carbon dioxide, water vapour, and dust) from the Ocean and land to the atmosphere Min) and from the atmosphere (Mout) to the Ocean and land exceed many times the anthropogenic discharges of these substances into the atmosphere (Mant) (Nigmatulin R.I. The Ocean: climate, resources, and natural disasters. Herald of the Russian Academy of Sciences. 2010; 80(4): 338-349). The overall content of carbon dioxide in the Ocean is 50 times higher than in the atmosphere, and even a weak “breath” of the Ocean can change dramatically the carbon dioxide level in the atmosphere. Natural causes play the most important role in climate variations rather than human activity since natural factors are substantially more powerful. Antarctic ice cores provide clear evidence of a close coupling between variations of temperature and the atmospheric concentration of carbon dioxide during the glacial/interglacial cycles of at least the past 800-thousand years. Analysis of ice cores shows that the concentration of carbon dioxide in the atmosphere follows the rise temperatures very closely and lagged warmings by 800±400 years. During the glacial/interglacial cycles the peaks of carbon dioxide concentration have never preceded the warmings. Therefore there is no evidence that carbon dioxide is a major factor in the warming of the Earth now. Considerable changes of the atmospheric concentration of carbon dioxide always determined by corresponding temperature fluctuations of the World Ocean. Thus, the quasi-bicentennial variations of the TSI (allowing for their direct and secondary impacts, with the latter being due to the secondary feedback effects) are the major and essential cause of climate changes.The Sun is the main factor controlling the climatic system and even non-significant long-term TSI variations may have serious consequences for the climate of the Earth and other planets of the Solar system. Quasi-bicentennial solar cycles are the key to understanding cyclic changes in both the nature and the society. The sign and value of the energy imbalance in the Earth-atmosphere system over a long time span (excess of incoming TSI accumulated by the Ocean, or its deficiency) determine a corresponding change of the energy state of the system and, hence, a forthcoming climate variation and its amplitude. That is why the Earth’s climate will change every 200±70 years; and it is the result of bicentennial cyclic TSI variation. 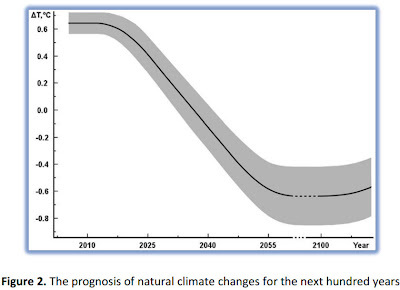 The observed long-term decline of TSI and forthcoming deep cooling will, first of all, essentially affect climate-dependent natural resources and, hence, influence, in the first place, economic closely connected with state of the climate. The most reasonable way to fight against the coming Little Ice Age is a complex of special steps aimed at support of economic growth and energy-saving production in order to adapt mankind to forthcoming period of deep cooling which will last approximately until the beginning of the 22nd century. Early understanding of reality of the forthcoming global cooling and physical mechanisms responsible for it directly determines a choice of adequate and reliable measures which will allow the mankind, in particular, population of countries situated far from the equator, to adapt to the future global cooling.